If Yoda shilling for cup noodles made your skin crawl and your soul cry “Nooooo,” get ready to feel the Force sell-out even harder, and weirder, with a recent spate of George Lucas-approved shameless Star Wars marketing tie-ins. First, there’s Darth Maul and Yoda stumping for Lipton iced tea. Embarrassing, but that’s nothing compared to the super disgusting idea of a Darth Vader-themed hamburger featuring black-dyed buns. Blech. 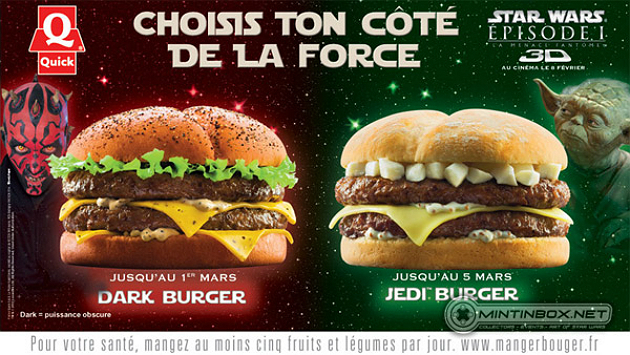 These are not the burgers you’re looking for, at least not to eat. You can thank the upcoming 2012 release of Star Wars Episode I -- The Phantom Menace 3D for the upsurge in shameless cross-branding, which is fine and a part of the business, especially when reintroducing a film to newer audiences and older fans who are now old enough to drink iced tea and order gross burgers at the drive-through. Still, that doesn’t excuse Lucas from the real problem: These burgers look completely disgusting. 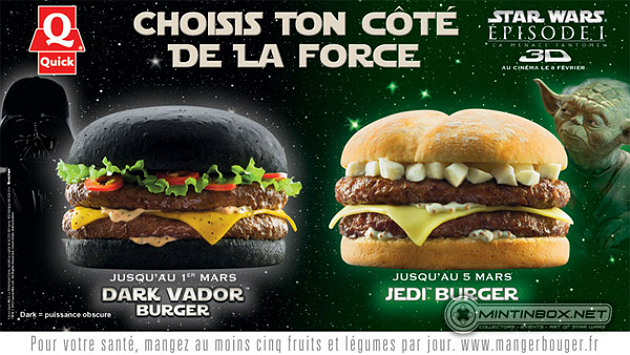 Who in their right mind will be ordering the Vader burger? French diehard Star Wars fans, I’m sure, and the kind of perversely curious fast foodies who thought the Double Down sounded intriguing. Oh, and maybe the members of the International Church of Jediism, followers of a new faith whose quest for recognition was immortalized this week by the Taiwanese animators at NME. According to the NME news video, these real life Jedis hang out drinking Mountain Dew and eating Doritos. Substitute the Quick Jedi Burger for Communion bread and everybody wins, no? Its spelled Vador because Darth Vader became Dark Vador in France. Unfortunately not a unique case in the name destroying department, ie: Professor Snape => Professor Rogue.